Even if they’re not fighting off vampires, ghouls and ghosts, Halloween poses a myriad of challenges for parents. But this year, the Teal Pumpkin Project is aiming to make things a little easier, at least for trick-or-treaters with a food allergy-sufferer in tow. The plan? People who place a teal pumpkin outside their house are indicating they’re handing out nonfood items this year. Parents will have a visual cue to identify which houses are safe for their kids to visit. With no candy present at all, there’s no cross-contamination to worry about, and kids can still have the fun of trick-or-treating without having to put themselves in danger. Food Allergy Research and Education, which is spearheading the movement, suggests handing out things like glow sticks, stickers and small toys. You can also look at this map to find homes in your area that are participating. This is more effective than having families swear off handing out peanuts or keeping just a few nonfood items out along with the candy — for those whose allergies are really severe, the safest bet is to avoid homes handing out candy altogether. And hey, it gives you a chance to whip out your paintbrushes and get down with your artsy self rather than getting up to your elbows in pumpkin guts. 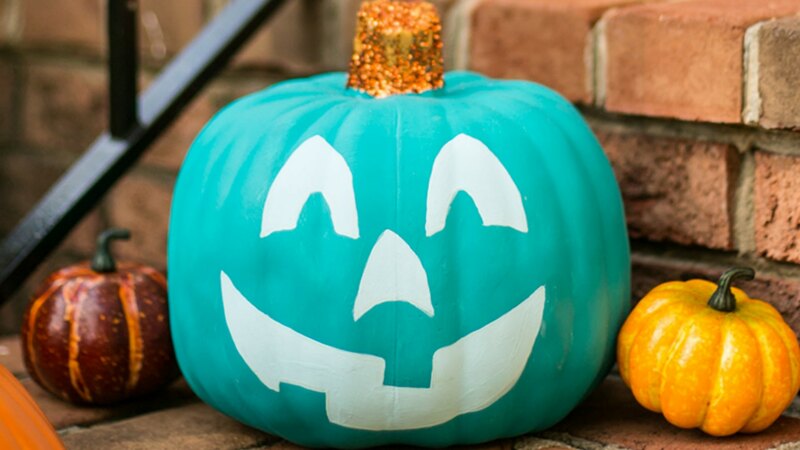 Considering the fact that more than 8 percent of kids in the U.S. suffer from food allergies, it seems like high time something like the Teal Pumpkin Project came along. Their goal is to have at least one house in every neighborhood with a teal pumpkin out front — this year, maybe it will be you.